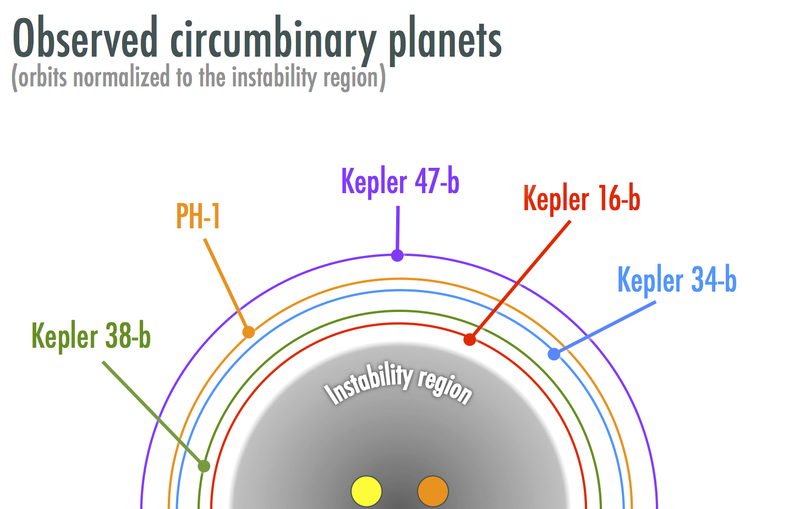 The discovery of PH1, together with all the other circumbinary planets identified by Kepler, provides theorists with an incredibly important clue on how planets form in binary environments. The clue is that these planets, rather than being mere sci-fi tropes, are actually detected in Nature! Their existance is all the more remarkable when we consider that all the planets detected so far (including PH1) orbit rather close to the central binary; so close, in fact, that they almost straddle the region of dynamical instability (inside which a planet would eventually be either ejected or collide with one of the stars). The fact that these planets successfully formed and survived to be observed by us indicates that the process of planet formation must either be very robust to the dynamical perturbations from the central binary (if the planet formed near its current location), or have happened in a less disturbed region (with subsequent migration to the current location). Planet formation in tight binaries has long been the subject of a number of studies in the scientific literature; indeed, both our closest neighbor, Alpha Centauri, and the system hosting one of the first detected planets (with a tentative detection dating back to 1988! ), Gamma Cephei, are examples of tight binaries where planet formation is significantly hindered. The discovery of the first circumbinary planet, Kepler-16, reignited interest in the topic, and I (together with a number of other teams) have been performing numerical simulations that model planet formation, in an attempt to better understand the physical processes at play. Binary systems represent a stringent test for planet formation theories, since the environment can be highly disturbed by the presence of multiple stellar components. Computer simulations show that the planetesimal stage is the most vulnerable to disruption, becoming a “bottleneck”. This bottleneck is primarily caused by the interplay between the gravitational perturbations of the binary (which raise the eccentricities of planetesimals) and the aerodynamic drag from a protoplanetary gas disk (which acts to misalign the planetesimal orbits). 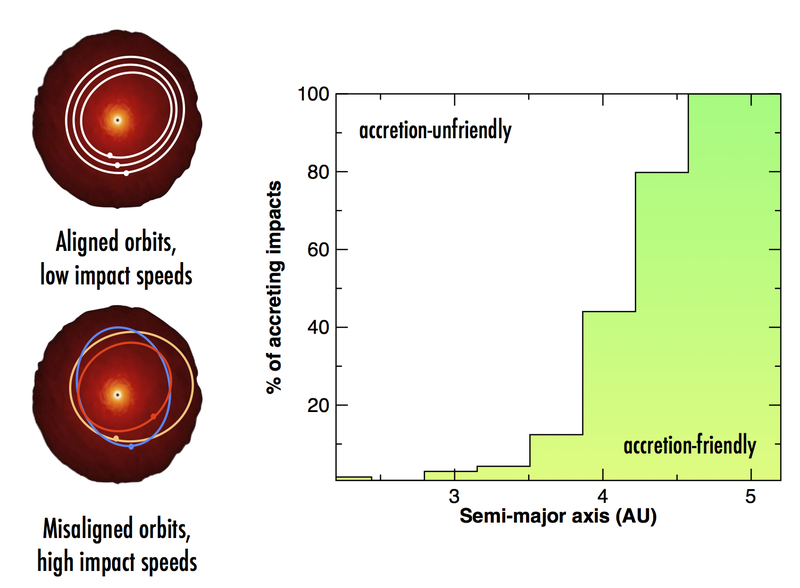 The latter misalignment raises the velocities at which planetesimals collide, such that instead of growing into larger objects, they get destroyed. The reason why the alignment of the orbits is crucial is easy to understand: imagine the collision between two cars on two contiguous lanes, versus that of two cars colliding at an angle. The latter collision will be much more violent, as there will be an additional velocity component perpendicular to the motion of either cars. The end result is that, in the simplest models, planet formation can only proceed far enough from the central binary (in the case of Kepler-16, outside 4 AUs). The implication is that circumbinary planets might only be able to form far enough from the central binary (how “far” depends on the properties of the central binary), and subsequently migrate to their current observed location. This picture, while attractive, might be too simplistic to capture the full complexity of planet formation in this environment. More realistic models will need to include a number of physical ingredients (such as the dynamical evolution of the gas disk), which are usually neglected for the sake of computational expediency but could potentially play a big role in determining how and where circumbinary planets were formed. For instance, my models indicate that even small perturbations from turbulence in the disk can make the disk hostile to planet formation by perturbing planetesimal alignment. Comprehensive (and computationally expensive!) simulations of planet formation in the binary environment are still ongoing: they might reveal further roadblocks, or uncover “sweet spots” in the range of physical parameters where planet formation can proceed. As the census of circumbinary planets continues to grow thanks to the efforts of scientists and volunteers, it will provide a larger sample of planets to inform and constrain our models. I wonder if this type of “Comprehensive (and computationally expensive!) simulations of planet formation in the binary environment”….might be accomplished cheaply and quickly by an all citizen scientist volunteer distributive computing project (ala BOINC)?